Are you smarter than an FOMC’er? Short-term interest rates are influenced first and foremost by monetary policy. So if you want to know where rates are going–and when–you would want to know what the members of the FOMC are thinking. Right? They’re in the driver’s seat, with their collective foot on the gas pedal or the brake. Hence, pundits, strategists, portfolio managers and traders all carefully tear apart the FOMC pronouncements, going so far as discussing the meaning of changes in punctuation. Even the members of the FOMC are not of one opinion. At the end of this year, opinions for the Fed Funds target rate are clustered between .125% (2 members) to .875% (5 members). But for the end of 2016, the opinions are in a wide range–from .375% (1 vote) to 2.875% (2 votes). Yet waiting for higher rates remains very popular. However, by trying to time rates and underallocating to bonds, investors may unwittingly be taking on more risk by missing out on the diversification benefits of holding bonds with their stocks. We believe it is unwise to try to time interest rates, and suggest instead to mitigate the risks of a rising rate environment by adjusting within fixed income (which specific investments you own), rather than shifting your asset allocation. Click here to read more about timing rates. This is an update of my earlier post dated May 26, 2015. 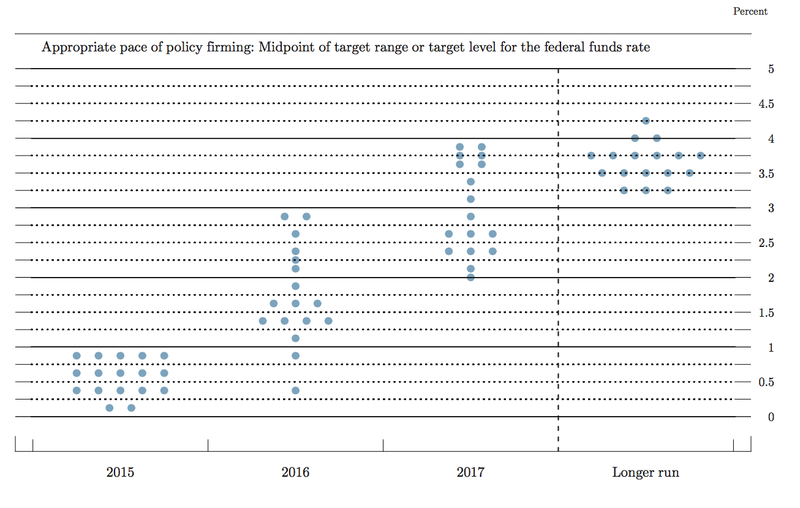 The source for the Dot Plot is available at the FOMC website. The information contained herein is based on sources believed to be reliable, but its accuracy is not guaranteed. Past performance is interesting but is not a guarantee of future results. The author does not provide investment, tax, legal or accounting advice. Investors should consult with their own advisor and fully understand their own situation when considering changes to their strategy, tactics or individual investments. Investments in bonds are subject to gains/losses based on the level of interest rates, market conditions and credit quality of the issuer. Additional information available upon request. It’s Friday, and time to think about other things. Rate Forecasting: Just Ask the Magic 8-Ball! To the list of surprise factors that can affect the bond market, we’ll have to add comments from the ECB. Of course, the list of bond market factors is endless–and growing! New factors will always be just around the corner. If you are determined to try to time interest rates you will need to forecast how much and when rates will move. Being correct on both is very difficult–even for the most experienced full-time professionals with significant resources and research support. Ask Bill Gross about that and his trade on German bunds. For most investors, having an “opinion” about the direction or magnitude of changes in interest rates has as much analytical rigor as asking the Magic 8-Ball. This is not to suggest that investors should ignore the prevailing winds or forecasts, but is meant to reinforce the idea that your goals cannot wait on the markets. Know what your goals are (ideally by having a financial plan or investment policy statement) and then select the individual investments that make the most sense–given the market conditions and trends. Don’t make an asset allocation decision instead of a security selection decision. If the market volatility is too much, consider delegating your decisions to a professional manager. By the way, if you don’t have a Magic 8-Ball handy, Wikipedia has a handy list of all of the 8-Ball possible answers.